Winamp VST software is a DSP or Effect plugin for WinAmp that hosts VST effect plugins allowing you to use your most best VST plugins within WinAmp software. The VST mean professional audio effects. 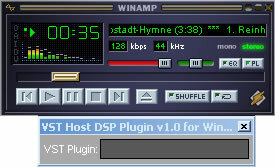 Although only one plugin is enebled, several plugins can be linked by using a VST Winamp plugins.